The Field of Hope this year has been one adventure after another. It is amazing it was brought to bloom and rather ironic as well. There were adventures along the way, challenges, obstacles, yet here we sit with the flowers in full bloom. What is most ironic to me is as the flowers are blooming, I am losing one of the most important people that have ever come into my life, Paul. Paul is on the advisory board of iFred and is one of those people that just epitomizes a good person – and everything a person should commit to be. He doesn’t drink, smoke, has solid faith, exercises, is genuinely kind, does not judge and loves with all his heart. He is the kind of person I think everyone should aspire to be. So to me in many ways this blooming is bittersweet as he was a big reason the field was able to happen. I’ve been writing a poem about who he and what he meant to me and everyone else to help express my love for this great man and ease my pain. But the reality is nothing hurts more than the loss of a dear friend, a major life event and one that is known to trigger depressive episodes. There are three things that make you susceptible to depression / trigger an episode; abuse in childhood, genetics, and traumatic life events (death of a loved one being on top). So with my history of depression, while I am happy of the blooming I must think of how I will cope. So I am working to feel and experience the pain and loss, as opposed to escaping, as while escaping might be nice in the short term I know through in the long term it will only hurt me. And I will use my creativity to bring forth beautiful things to express my feelings – art, poetry, music, song, and love. I am recognizing my vulnerability and making sure to eat well, sleep, exercise, pray, surround myself with those I love and be good to myself. And I will keep Paul and his family close to my heart and rejoice in what the field is bringing to others. Dan Taylor managed the field, and we couldn’t have been luckier, as he is the one that made sure it came to fruition as there were many times along the way it was questionable. We had major issues first with flood, which pretty much never happens in Accra (figures!). Dan was there through the night when the flood came and helped drain the field after and salvaged the flowers he could. He managed to get additional flowers donated to cover the ones we lost, and got donations of fertilizer to make sure the ones that made it actually survived. When we ran out of money for the project he continued to support it and see it through to the end. He did not give up. He gave his own time and money as he believed it was a field and project much greater than him, symbolic that we should not give up in times of despair no matter what road blocks may lie ahead. Something that anyone experiencing depression always needs to remember. The field brought together so many in Accra, so many that would not have otherwise spoken of depression or mental illness. The Field of Hope was non controversial – a beautiful project and intrigued people enough to discuss it. And once they found out what it was for, it seemed many had stories to tell. They slipped in the night to help how they could, donating items – a miracle in and of itself. In Accra, Ghana and throughout Africa I learned that people with any type of me ntal issue – they are treated as if they have ‘demonic spirits’ in them. That is what most believe there. The individuals are chained to trees and made to fast in the hot sun – so as to rid them of these so called ‘spirits’ – stripped of rights and subjected to mental, physical and sexual abuse. Why everyone can not accept that problems with the brain are no different than problems with the heart, lung, or kidney is completely baffling. Depression is a treatable disease, yet people are needlessly suffering and dying because it is feared. Even in the U.S. – we just recently established Mental Health Parity laws – laws that basically say that people with mental issues should be given the same treatment as those with physical issues (while of course we have to start somewhere, is it really true progress?). People in the mental health field are very excited about that, and while it is a good thing I wonder how it is possible that so much money, time and effort was spent making this happen when we could have used it treating those effected. The brain is not a ‘special organ’ detached from the rest of our body, in fact it is the most complex organ in the human body and it connects and influences everything we do – it would seem a no-brainer that we treat it as the gem that it is and do all we can to keep it healthy. Just getting the brain now included in our insurance plans seems archaic to me, again I am glad it happened just wish we were further along. As I look back at the first photo of the field, I reflect on how much it looks and feels like depression in many ways. Muddy, dirty, blah, unattractive, stagnant, colorless (well, brown), sick, unworthy…. those are some things that come to mind. And then I think about all of the issues with the field but saw how people continued watering it, allowing sunlight, and providing nutrients, nurture, faith, and commitment. 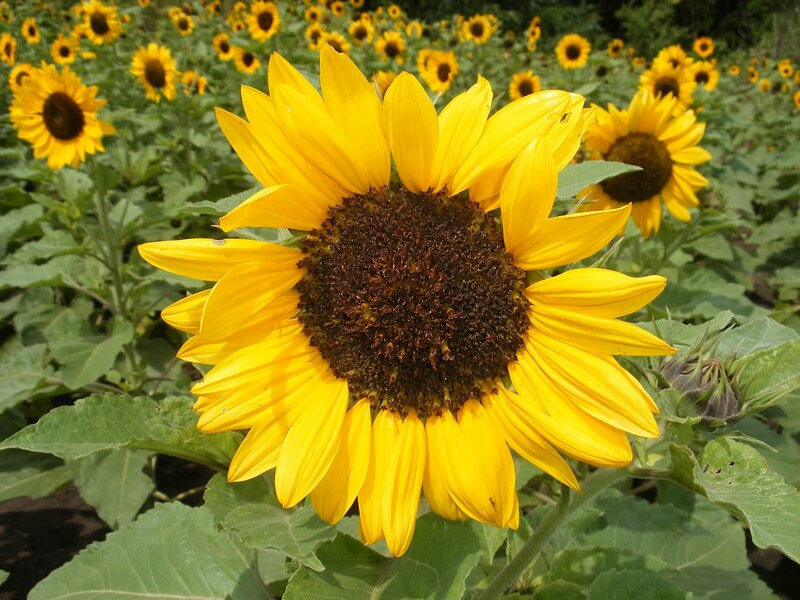 And I look at where we ended – a beautiful, proud, yellow, joyful upright sunflower facing the sun. They even look proud to me. Just as someone might look if they had managed their depression successfully after a hard stretch. For those who don’t know – it is such an amazing sight to see. The World Health Organization estimates that by 2030 depression is going to be the #1 cause of death and disability worldwide – and do you know why? Because people are afraid of acknowledging it. It amazes me each and every day that depression is up to 80% treatable, yet less than 25% are getting treatment in the U.S. alone (2% in Ghana) due to stigma and lack of funding (most likely due to stigma). We could prevent so many problems if we paid attention and showed acceptance. Why we don’t, in the 21st century, I just can not understand. But maybe, just maybe, by reading this you will see someone with depression differently in the future – you will understand they may be dark and murky, but with love, nurturing, nutrients, sunshine and care they will come out of it brighter than ever. You will give them love and hope and support and encouragement through their dark times. To all of those that worked tirelessly on the Field this year thank you. We are planting a seed towards acceptance and while it may not be understood now I have faith it will in the years to come. And I want to especially thank Paul and his family for their constant support for something that they may not fully understand or personally experience, but continue to encourage with an open heart and mind.